Small duck with large grey bill. Male has dramatic white eyebrows on a brown head and pearlygrey flanks contrasting with the brown breast and spotted brown stern. Displays silvery-blue forewings in flight. 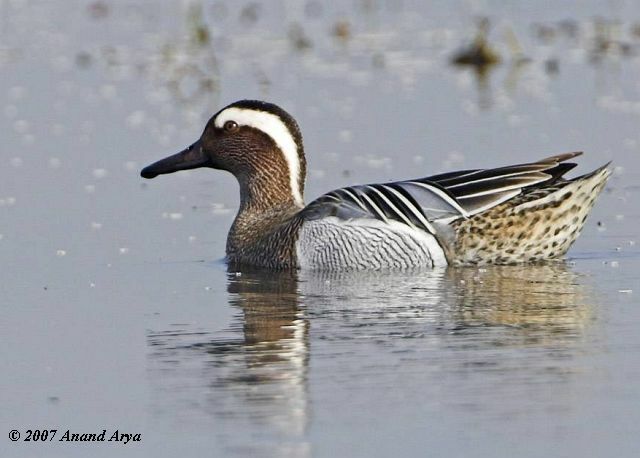 Female similar to Common Teal, mottled brownish but with distinct eyestripes and pale supercilia, loral and chin spots and larger bill. A fast and agile flyer. Habits: Gregarious and very social, mixing with other species. Inhabits thickly vegetated jheels, coastal lagoons, swamps and paddy. Abundant winter visitor in south, mainly passage migrant in northern areas. Also occurs in Africa, Eurasia and Indonesia. Male has distinct dry cricket-like rattle. Female makes a quiet quack.